In 2004, four congregations of religious women came together to respond to the community’s call for an all girls’ tuition-free middle school in southwest Baltimore. The result was Sisters Academy of Baltimore – founded by the School Sisters of Notre Dame, Sisters of Bon Secours, Sisters of Mercy, and Sisters of Notre Dame de Namur – which now serves 63 girls in grades 5-8. “It has been a once in a lifetime opportunity, to work together as educators and begin something from nothing,” comments Delia Dowling, SSND, President. She describes the collaborative effort of the four congregations of sisters as “the wave of the future and the Church,” in that religious communities are “stepping beyond themselves” to help meet unmet needs in the world. 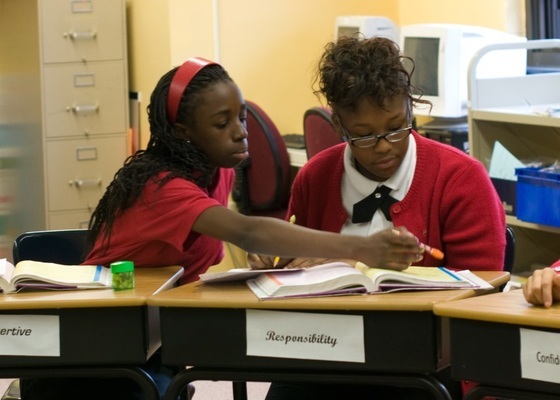 In Sisters Academy’s case, the needs are especially poignant: the students primarily come from west and southwest Baltimore, low-income neighborhoods where nearly half of the adult population has less than a 12th grade education. A welcoming spirit embodies the Academy. Every morning, the girls begin their day in the gathering space for prayer. One empty chair always sits in the corner. “It is there to show that we always have room for someone else, that we will always welcome a newcomer,” explains Kafui Anthony, an 8th grade student. Since Sisters Academy opened eight years ago, the Knott Foundation has provided $130,000 to the school in grant support, most recently awarding $40,000 in October 2010 to support three priorities – the graduate support program, technology instruction, and salaries for masters-level teachers. The graduate support program is integral to Sisters Academy’s graduates’ success, helping them in the selection and application process for high school and college while also guiding them through life after Sisters Academy. Notably, during the grant period, all fifteen 8th graders were accepted to Catholic high schools and received adequate financial aid to attend. In addition, 2012 marks a special year for the school with its first class of alumnae finishing high school. These 10 young women have been accepted to such colleges as Notre Dame of Maryland University, Stevenson University, Saint Joseph’s University in Philadelphia, and Lebanon Valley College in Annville, Pennsylvania. The Knott Foundation’s recent grant also supported the development of an integrated technology curriculum plan with specific learning goals by grade level. This planning helped, in part, to leverage $53,000 more in technology funding from sources such as the Abell Foundation and the University of Maryland BioPark. Meanwhile, the grant supported two teachers who completed Operation TEACH, a post-graduate service program offered through Notre Dame University of Maryland where teachers earn their master’s degree while working in local Catholic schools. “In addition to developing capable and committed teachers, the program gave me a large teacher support system that doesn’t always exist in schools,” comments Regina Fabbroni, an Operation TEACH graduate who now teaches mathematics and social studies at Sisters Academy. And so Sisters Academy’s mission of empowering girls to become agents of transformation in their families, communities, and society continues each day, with an open chair and a welcoming spirit for all who enter the school.